Rebecca Tsang (H.K) - BOUNDLESS HIMALAYAS TREKKING & EXPEDITION (P.) LTD. This is my 2nd visit Nepal. Uttam is my good friend and he was trekking guide. First time to visit Nepal. Again I came to Nepal with 5friends and Uttam arranged us Langtang trek for 9days. His cost always reasonable. We liked very much and we will try to come back gain. 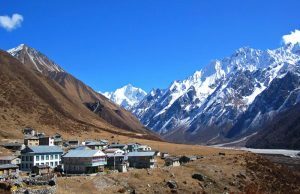 We had spent really good time, Langtang is so beautiful place, nice peoples etc.This time we got such a good guide. His name is Mr. Dorje Sherpa, who have got a lot of experience aon mountain trails. We trust that, Boundless has team work and good management. So we always wish to have all the best and every successful efforts.We were told trek Coca-cola trek!! This means we were told it was easy. It was not easy but it was fantastic. The most exhilarating experience and scenery that touches your heart.